Eunice Kennedy with brother Jack in 1941. My mother died recently, and needless to say, I've been thinking about her a lot. 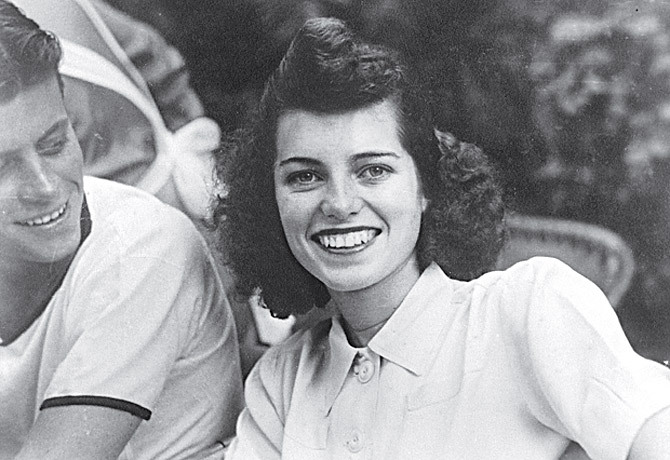 Eunice Kennedy Shriver was a trailblazer for American women. She was scary smart and not afraid to show it. She didn't buy into the propaganda of her day that women had to be soft and submissive. That took courage back then, because she grew up in a family that expected a lot from the boys and very little from the girls. My mother raised me to believe women had a unique power to change the language, tempo and character of the world. Her heroes were women: first and foremost, her own mother and the millions of other mothers of kids with intellectual disabilities  but also Dorothy Day, Mother Teresa, Clare Boothe Luce. She told me their stories because she wanted me to appreciate their impact. She encouraged me and other women to believe we had the ability to change the world. It's been more than four decades since her brother President John F. Kennedy asked former First Lady Eleanor Roosevelt to chair the very first Commission on the Status of Women. The goal: to find out how much progress had been made toward giving women "practical equality with men." Anthropologist Margaret Mead, who co-edited the final report, wrote, "The climate of opinion is turning against the idea that homemaking is the only form of feminine achievement." Since then, there's been a slow and steady shift of women into the workplace  a shift accelerated by today's recession. Women are more likely than ever to head their families; half those women who are primary breadwinners are also single mothers. Seventy percent of families with kids include a working mother. And more and more of them, like me, are moving into what I call "the Squeezed Generation," caring both for kids and for aging parents. To take the pulse of Americans, I put my journalist's hat back on and crisscrossed the country holding conversations with women and men on the front lines of this new American revolution. With our partners from the Center for American Progress, we produced The Shriver Report: A Woman's Nation Changes Everything, a landmark study that examines how families live and work today. Everywhere I went, people talked to me about how stressed they feel, especially when it comes to financial security. Women said that never before has so much been asked of them, and never have they delivered so much. Divorced mothers talked to me about trying to make do without child support. A single mother who had just lost her job told me she was utterly dependent on her family and friends just to stay afloat. A businesswoman on the West Coast told me she and her husband "are constantly renegotiating our agreement about what gets done [and] who does it." You hear a lot about the search for a "balanced life." More and more women say that if they could, they'd like to leave companies that are unresponsive and start their own businesses. Many of them do. In fact, the number of women working for themselves doubled from 1979 to 2003, so that women make up 35% of all self-employed people. Men are feeling out of sorts and stressed out as well. Wherever I went, I was surprised at how open men were to sharing their bafflement about what women want  and their insecurities about what's expected of them. "All of us grew up thinking this was a man's world, that doors were just gonna open to us because we had a Y chromosome," a Seattle man told me. "And suddenly we have to adjust to the fact that that's not the case. And the recession has made it even more intense for us. So every family is trying to figure out what does it mean that we're both working, or that I'm laid off and you're working? We haven't thrown some switch to go from a man's world to a woman's world. It's more like we're finally, for the first time, in a position where it's no longer only a man's world. Now what does that mean?" While there's much to cheer about these days on the equality front, we still have a long way to go. Women still don't make as much as men do for the same jobs. The U.S. still is the only industrialized nation without a child-care policy. Women are still being punished by a tax code designed when men were the sole breadwinners and women the sole caregivers. Sexual violence against women still is a huge issue. Women still are disproportionately affected by a lack of health-care services. And lesbian couples and older women are among the poorest segments of our society. Which brings me back to my mother. I know for sure that if she were alive today, she'd say of this report, "It's about time!" In articles published after her death, so many people were quoted as saying, "If only Eunice had been a man, she could have been President!" "If only." My mother learned from that. Her message to women was "Don't let society tame you or contain you." Today she could run for President. And I believe she would win. Shriver is the First Lady of California, a journalist and the leader of the Women's Conference. See a Kennedy family photo album.